Lovely Lane Chapel is located at Epworth by the Sea on St. Simons Island, Georgia. Epworth by the Sea was opened July 25, 1950 in honor of the boyhood home of John and Charles Wesley, the founders of Methodism. 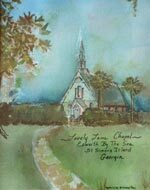 The chapel was built by Norman W. Dodge in 1880 and is the oldest church buidling on St. Simons Island. The beautiful stained glass windows are constructed of antique pieces of old English art glass. The chapel is a popular place for worship, prayer, baptisms and weddings.